The PolyLevel® system utilizes a high-strength polyurethane mixture that expands to fill voids under concrete, stabilize soil, and lift concrete slabs. With multiple formulas available, PolyLevel® can fit the needs of any commercial, industrial, or municipal job, large or small. Quality 1st Basements is a PolyLevel® contractor in New York City, Brooklyn, Bronx, Staten Island and surrounding areas. Call us at 1-844-237-3440 or click below to schedule a consultation with one of our commercial technicians today to learn how we can lift your sunken concrete slab using our fast, durable, cost-effective solution. Learn more about how PolyLevel® works and why it's a superior mudjacking alternative for fixing settled, damaged concrete slabs. Concrete raising for roads, bridges, highways, railroads & runways. Serious safety hazards occur when these concrete elements sink, so repairs must be made right away. Quality 1st Basements often relies on polymer injection or polyurethane concrete lifting to raise sunken concrete roads and runways. The main advantage with this technique is that the injected polymer cures to about 90 percent of its final strength within an hour after injection, enabling the road or runway to be used quickly. Stoop & driveway lifting. 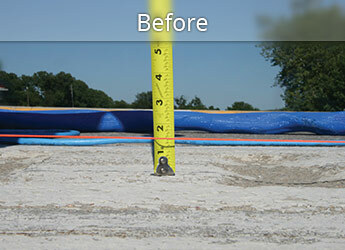 Mud jacking and polymer injection are two concrete lifting techniques that geotechnical engineers use to repair sunken stoops and driveways. 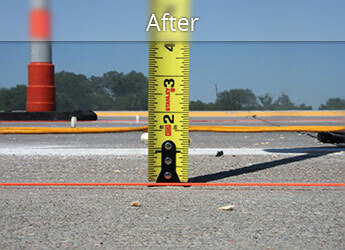 Concrete leveling can eliminate trip hazards caused by cracked concrete slabs. Rescuing a sinking in-ground pool. The combined weight of concrete and water can sometimes be too much for the underlying soil to bear. When this happens, an in-ground pool can begin to sink down. Quality 1st Basements can solve this problem by injecting an expanding polymer compound beneath the pool. The polymer’s expanding force can raise up the sunken pool, while also improving the load-bearing qualities of the soil. Concrete is hard to beat as a basic material for all kinds of load-bearing surfaces, from driveways and pool decks to floors, roads and airport runways. However, concrete has two characteristics that can cause problems: it's heavy and it can't stretch. In addition to unsightly cracks, slab settlement problems can also result in potential accidents, poor drainage, tripping hazards and expensive property damage. We are NYC & Staten Island's trusted commercial concrete lifting contractor. Quality 1st Basements is your local expert for commercial concrete leveling and repair. Contact us today to schedule an on-site consultation and concrete leveling estimate to find out how PolyLevel® can solve your all your concrete problems, and we will provide you with an estimate for your commercial project. We proudly service Staten Island, Astoria, Flushing, Manhattan, Staten Island, Queens, Ridgewood, Elmhurst and many surrounding neighborhoods.